Adriaen Brouwer was exposed to art from a young age and helped his father, a tapestry weaver, create cartoons and designs for his works. A free spirit and a rebellious youth, Brouwer ran away to the Netherlands to make a name for himself as an artist. He was successful in doing so and his work was popular among his peers and was soon appreciated in both Flanders and the Netherlands. Brouwer was believed to be an indulgent and rather reckless character who never returned to his hometown. He lived quite a tumultuous and bohemian lifestyle and believed in seizing the moment. He can be described as a man of extremes, never afraid to express himself. Brouwer is best described to the ultimate 'bohemian artist' of the 17th century. Flanders' art scene prospered during the 17th century and many talented artists emerged. Soon the whole of Europe was demanding these works that heralded a new era in Counter-Reformation art and that of the Protestant North. Flanders, then referred to as the Spanish Netherlands successfully combined the tastes and styles of both influences successfully and made it their own. Flemish culture was by far one of the most unique in Europe as it combined various aspects of Christianity with their old traditional mannerisms. Adriaen Brouwer was an innovative artist in Flanders during the 17th century. A true rebel and outspoken man who never held back he was expressive with his works and conveyed emotional and psychological renderings through his works of the Northern lower classes of the Netherlands and Flanders. He introduced a new format whereby the subjects were painted as interior, instead of exterior, scenes and this fresh approach gained popularity among the Northern societies and his contemporaries alike. The greatest admiration for Brouwer's work was in regards to his subject matter and landscapes. Most of Brouwer's admirers were close friends too and most sought to recreate the emotional and psychological rendering that he so successfully executed in his works. It's believed that Adriaen Brouwer showed an early talent for art and participated in local competitions. After his father's death in 1622, he ran away from home aged just 16 and set out to make a name for himself as an artist in Amsterdam. 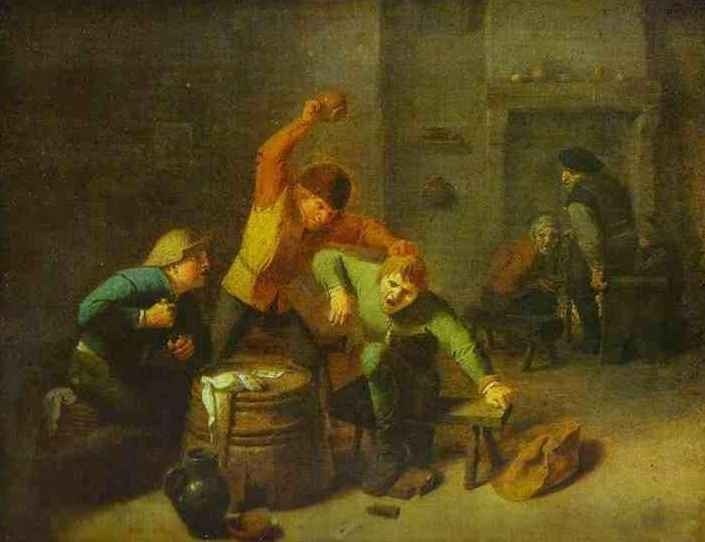 In Amsterdam Brouwer spent a great deal of time in local taverns and painted many of his works from events and moments that took place in them, representing the underbelly of 17th century Dutch society. Despite becoming addicted to tobacco and alcohol Brouwer was a prolific artist who quickly made an impression on the local art scene and some of his works were even purchased by Rembrandt. In 1631 he decided to return to Flanders and go to Antwerp where the great master Peter Paul Rubens was putting Flemish painting on the map. 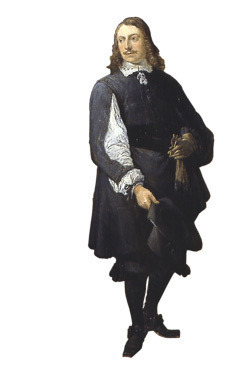 On Adriaen's re-entry into Flanders on the 22 September 1633, he was arrested by the Spanish troops as they thought he was spy form the Netherlands. He was taken to Het Kasteel, a prison and the headquarters for the Spanish army in Antwerp. It is believed that Rubens had to go to Het Kasteel and testify that Brouwer was not a spy but an artist born in Flanders. 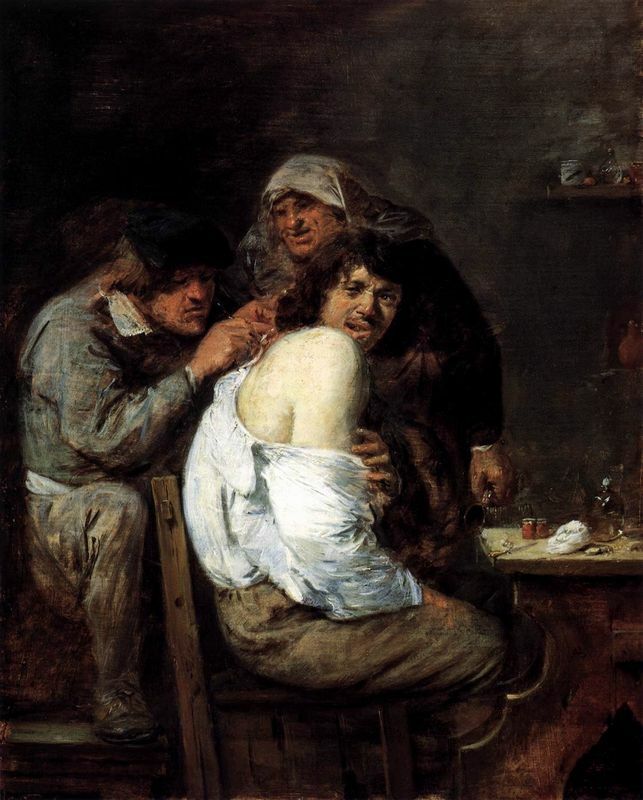 Rubens, who was highly impressed by Brouwer's work, invited him to come and work in his elite Antwerp studio but his unprofessional behaviour which included arriving for work drunk or high on drunks meant that he was thrown out after only a few days. Adriaen Brouwer died in January 1638, most probably of a stroke due to his tobacco addiction and drinking habits. Adriaen Brouwer's work was as colorful as his personality. His subject matter mainly consisted of the lower classes living in 17th century Northern societies. Many of the wealthy patrons who bought his works only did so to reinforce their own status and boost their ego. Each of the artist's work had some connection to the lower classes. Such people were not only his inspiration but also his friends and acquaintances. In his works he demonstrated what was being avoided and denied with regards to social truth and was most comfortable portraying the more vulgar aspects of daily life as he saw it. Brouwer had no respect for the moral value system in Flanders and his works were very much a reflection of himself. He refused to show respect for a cultural and political regime that denied the real society and the common human attributes that boded humankind. Brouwer's painting style is best described as loud and brash. He used broad and rapid brush strokes as he would quickly sketch and sometimes paint these works while he was drinking in these taverns and would complete them in between drinking, smoking and socializing. Later on his brush work and style can be largely attributed to his master, Frans Hals after studying at his Haarlem studio. Brouwer completed a total of 130 works including sketches. His painting techniques also changed over the two decades he worked as an artist. 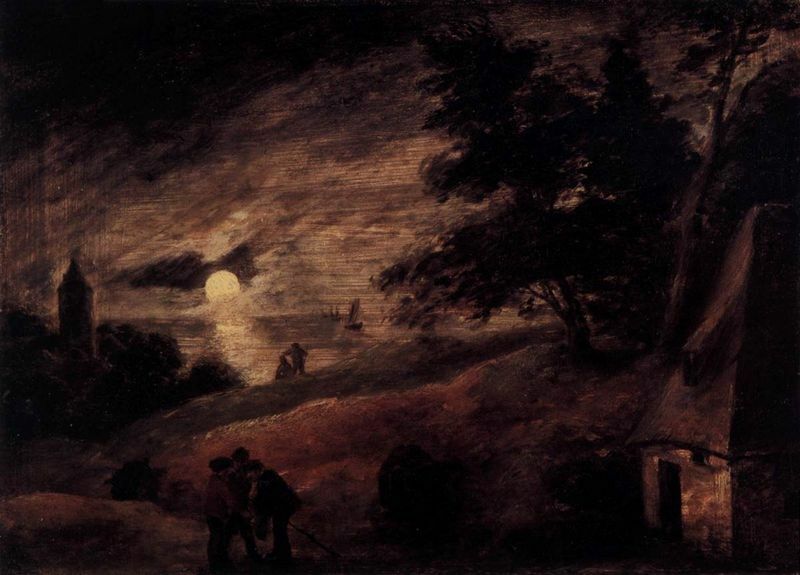 Adriaen used a diverse color palette and his colors defined depth and dimension in his paintings. He was particularly talented in blending his tones to create a natural rhythm and harmony. 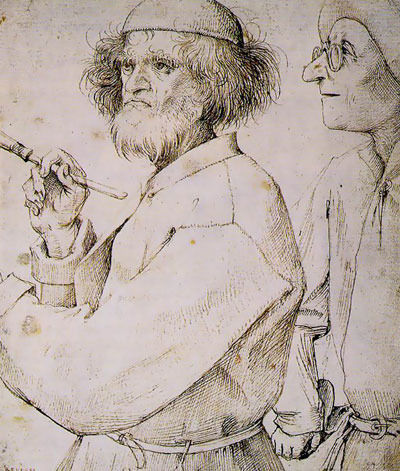 Like his contemporaries, Adriaen was also an excellent draughtsman. He used various charcoal and pencil to create his works that were a preliminary to his final works. These works can be seen to be done at a quick pace as he would draw them while he was drinking and socializing in the tavern. These works also served as his compensation for his lack of monetary funds to pay for his bar tabs. It can be said Adriaen Brouwer's main influence was Frans Hals but his earlier works adopt the early mannerist Flemish style of Peter Breughel the Elder. The Brueghels were most likely the first artists whose works the young Brouwer encountered whilst still living in Oudenaerde. He draws on the stylistic influence of the Brueghels in his bold and clear coloring in his first works. 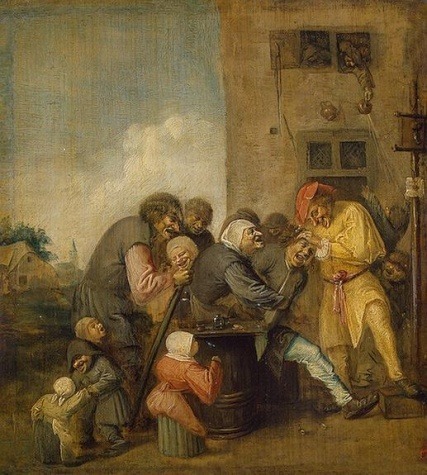 Brouwer was also influenced by Brueghal the Elder's subject matter in painting daily life and the aspects of this that were not considered the most ideal, such as beggars and peasants. He also copied his style of non facial-detail and basic outlining which gave a general impression of the individual. 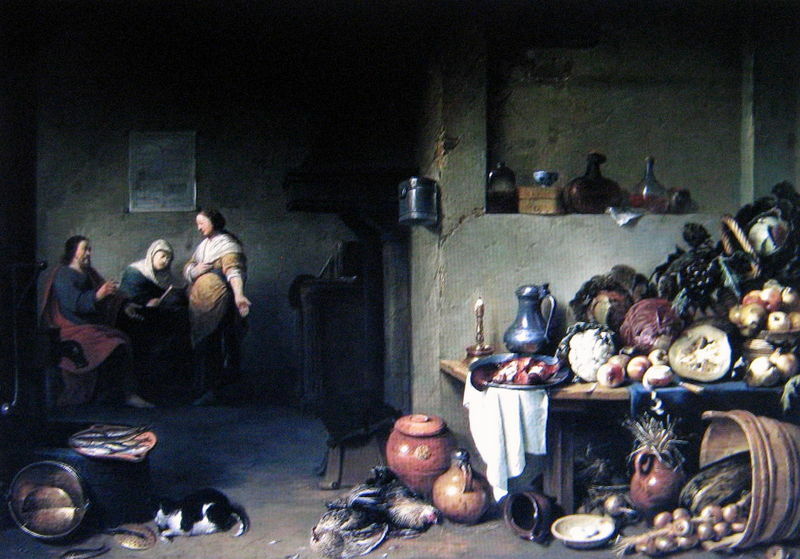 Brouwer's early tavern scenes in particular are shown to contain the same simplicity in form and coloring as Brueghel the Elder. 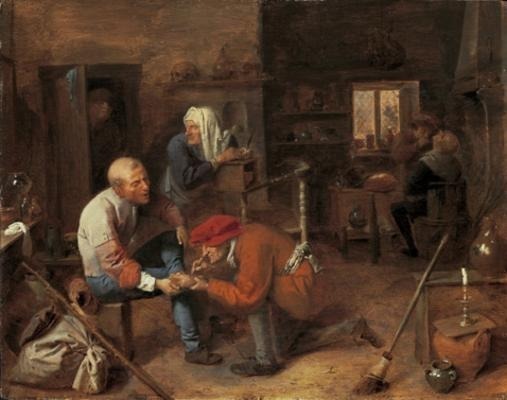 Hals was arguably Brouwer's main and most important influence in terms of his painting techniques and also in recreating new aspects of characterization. After his training in Hals' studio Brouwer started recreating his compositions using various symbols and objects and dark chiaroscuro techniques. He also began painting more solitary figures and used various stances and symbols to accentuate their character. Furthermore, he started adding more detail to his faces and adopted rougher and bold brush strokes. It is a fact that Rubens greatly admired the young artist Adriaen Brouwer and had the best collection of his works. Rubens was well acquainted with Brouwer and they became good friends. 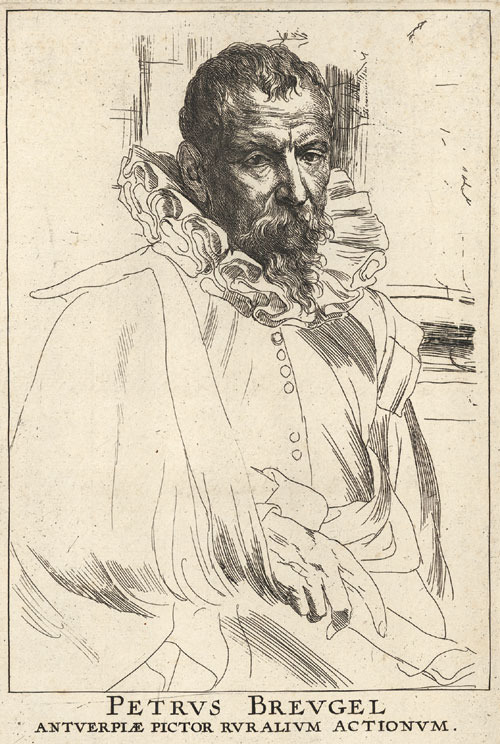 Brouwer frequented Rubens' studio and began adopting Rubens' slanted dimensions for his compositions, especially in his crowded tavern scenes. This technique was evident from his second time in Antwerp when his style had fully matured. 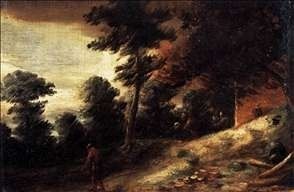 Rubens' influence is also evident in Brouwer's landscapes as he also recreates a psychological and emotional rendering of the flatlands of Antwerp with a hazy softness. Adriaen Brouwer left a lasting legacy in the art world and his works were loved by all of the Northern societies and he received a great deal of coverage especially during his time in Amsterdam and Antwerp. He acquired many followers during his career, many of whom were also friends. 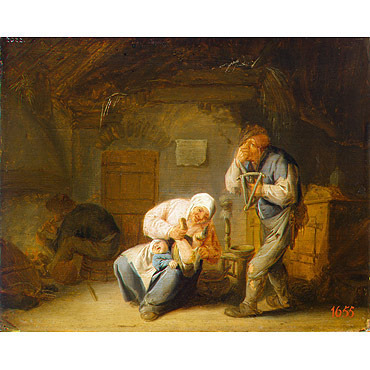 The greatest admirers of Brouwer's peasant subjects were the Dutch painter Adriaen van Ostade and the Flemish painter David Teniers the Younger. Van Ostade studied with Brouwer at Hals' studio and took on the same raw subject matter. He followed Brouwer's style of painting the emotion of common folk and individuals in natural poses. This is demonstrated in works such as Sense of Smell. 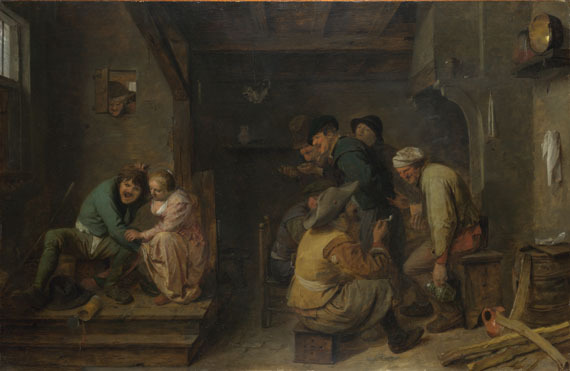 Despite the fact that Teniers' style was very different to that of Brouwer, his influence was very evident in Teniers' earlier interior scenes of taverns and Flemish domestic life. He also adopted Brouwer's use of bright colors in dimmed lighting conditions. Teniers' compositional techniques of deeper rooms and the creation of space and dimension through color and shadow can also be attributed to Brouwer. Pieter de Bloot was born and lived in Rotterdam and was mainly a landscape artist but also painted tavern scenes as Brouwer did. He also painted humorous scenes and sought to recreate an emotional rendering of the subject matter through various natural expressions and postures. 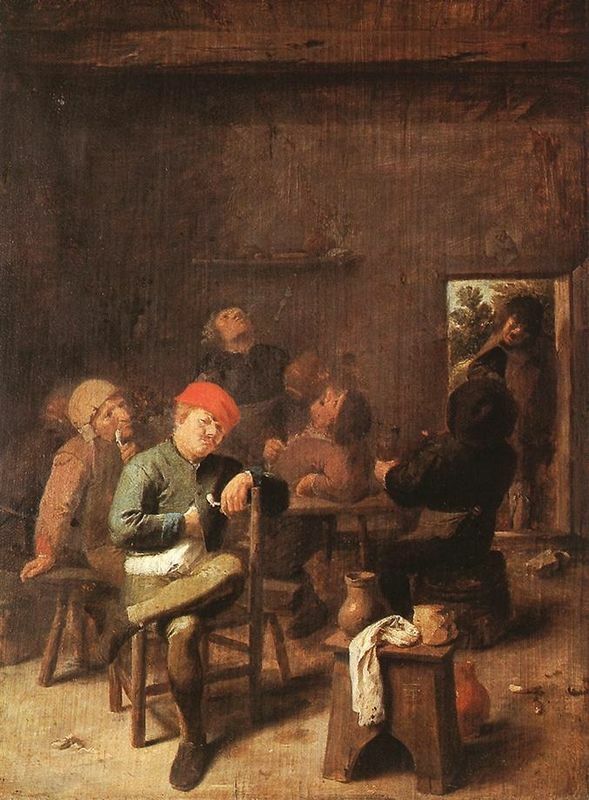 Saftleven's tavern, peasant and portrait works were largely inspired by Brouwer with regards to style and color palette. Saftleven was also known for his evil scenes, devils and depictions of hell and debauchery and he substituted the vulgarity of various individuals by painting them as animals to express their true characters. Sorgh was greatly influenced by Brouwer particularly in his choice of subject matter in works such as Card Players. Sorgh adopted the same intense, emotional features in his sitters over the table of cards as well as a bright color palette. 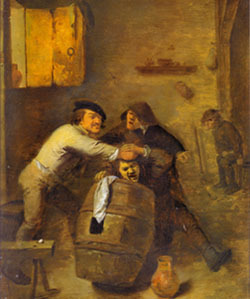 Sorgh mainly focused on Brouwer's various stylistic techniques that rendered the natural aspects of Protestant Dutch society without high drama. Other followers of Adriaen Brouwer include Joos van Craesbeeck, David Rykaert III and Gillis van Tilborch. "As he was in his work, so he behaved in life"
Adriaen Brouwer greatly influenced his contemporaries and his scenes of peasant life became hugely popular in both Dutch and Flemish art of the 17th century and made a lasting impression on the art world overall. Many early biographers claim that Brouwer was a bohemian artist who led a reckless life and accumulated huge debts during his career but such claims are now thought to be invented. This is because at the age of just 21 Adriaen Brouwer was labeled a master. Although his depictions often included rather crude subject matter his figure paintings were noted for their precise color and refined execution. His landscape works, produced during his final years in Antwerp were also recognised for their startling freshness and profound quality. Brouwer was skilled at being able to immerse himself in his surroundings but extract himself when necessary to execute his works. He became an observer in local taverns and detached himself enough to create his vivid, realistic images. Such images could only have been produced by a sober man who was in complete control of his senses. 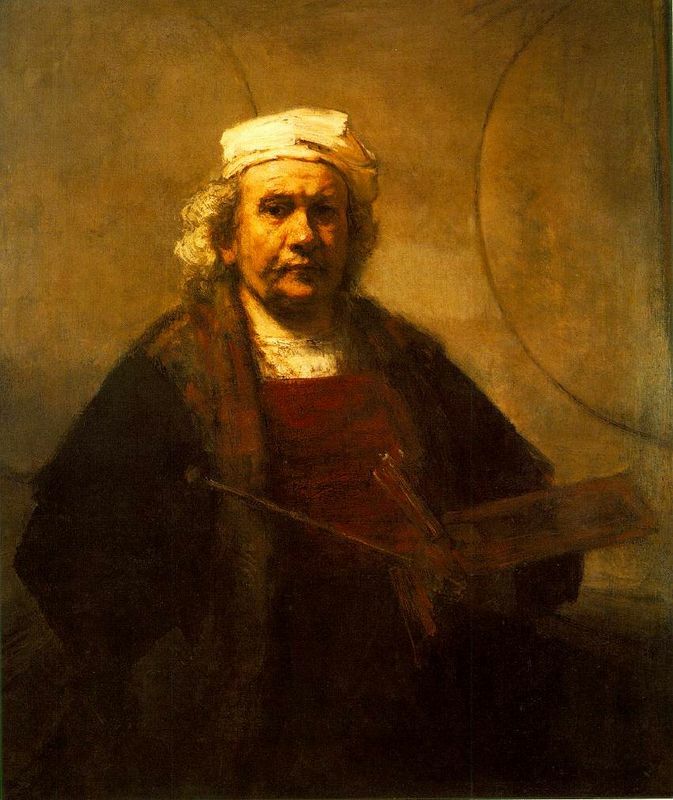 Brouwer's workmanship was impeccable and was greatly admired by no less than Rembrandt himself. 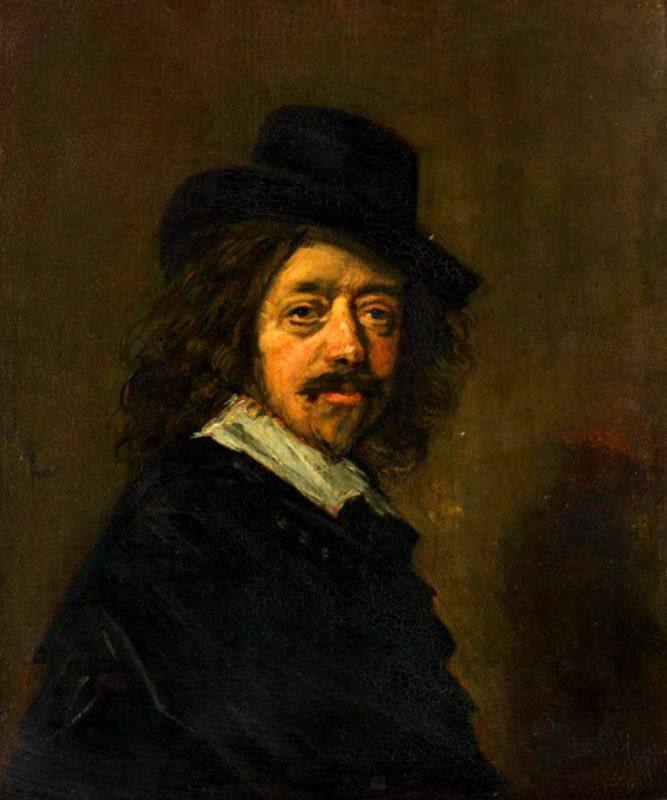 Both Rubens and Rembrandt had numerous Brouwer paintings in their own collections and Rubens owned more works by the artist at the time of his death than any other painter. It was Brouwer's verve and taste in composition that allowed him to stand out from his peers and influence masters such as Adriaen van Ostade, Jan Steen and David Teniers the Younger. Whether for his craftsmanship or concepts, Adriaen Brouwer is possibly the greatest painter of the lower classes that ever existed and today his works can be found in the best art museums around the world. To read more about Adriaen Brouwer and his works please refer to the recommended reading list below.